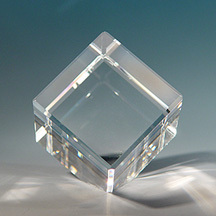 80mm X 80mm X 80mm 2D Corner Cut Crystal Cube Perfect for Engraving. Capture the moment in crystal and cherish it forever. Have your own photo laser-etched inside crystal. Your image can be lasered as a standard 2-dimensional image, or you also have the option of having your image converted to 3D for an additional fee. After your order is placed, please use the navigation on the left or click here to upload your artwork. Please feel free to take a moment and look here to learn how the process works.